MassMutual Reviews - Is it a Scam or Legit? MassMutual’s line of financial services, investment tools, and professional assistance claim to help you meet your financial goals and protect your nest egg. In business since 1851, MassMutual promises to help you plan and protect your financial future, save for college, manage your retirement income, implement long-term care, and more. How so? MassMutual offers a variety of investment tools and services to match your unique situation and goals, like annuities, life insurance, disability and income insurance, and wealth management and trust services. MassMutual also teams up with employers to provide workplace benefits that can help you administer your retirement plan while providing tools like supplemental individual disability income insurance, executive-level life insurance, and more. Even if you’re not a customer, the resources and guidance available on MassMutual’s website, such as articles, calculators, and videos, might help point you in the right direction. Compared to the competition, though, is MassMutual more deserving of your time and money? Are there any factors to consider for each of their services? You have questions, and in this article, we'll help provide some answers. Which Products & Solutions Does MassMutual Financial Group Offer? MassMutual provides access to a variety of tools that can help you build your financial future. In this section, we’ll cover each key area and quickly discuss the pros and cons. Sold by insurance companies, an annuity is a bundle of investments wrapped inside an insurance policy and is sometimes referred to as a personal pension. Why? Annuities allow you to contribute a certain amount of money (whether lump sum or over installments) to an account and grow the balance over time. Then, once you reach a specific age, you begin drawing a predetermined monthly income from the account. Combined with traditional investment vehicles like a 401(k), annuities are one of the most popular financial tools to help you comfortably prepare for your retirement years. Fixed Deferred Annuities – This is a conservative investment that provides guaranteed fixed interest rates, principal protection to shield against market ups and downs, as well as income options (guaranteed income for life, for a specific period, or for a combination of both). Income Annuities – As long-term investments, MassMutual's income annuities provide little-to-no liquidity, but they do provide guaranteed income, and you get to choose when you'd like to receive it. Variable Annuities – If you have an appetite for higher-risk investments, a variable annuity provides the opportunity to choose between different asset classes and investment styles, as well as guaranteed death benefit options. Which of these options is best for you? To get a basic handle on the situation, we’d recommend reading the Wall Street Journal’s article How to Select and Shop for an Annuity. MassMutual’s disability income (DI) insurance can help you continue meeting your financial obligations if you become disabled, even if you already have group long-term disability income insurance in place through your employer. You’ll be able to customize your coverage through a variety of contract riders, including income protection and keeping your nest egg safe with retirement protection. Through MassMutual’s Essential Protection package, you can combine DI insurance with a life insurance policy (we’ll talk more about this soon) to help you keep your income safe. Mutual Funds – As a collection of multiple funds, a mutual fund allows investors to pool their money together and invest in a variety of stocks, bonds, equities, and other securities. Mutual funds are overseen by money managers, who choose which securities are best based on the fund’s overall goals. Mutual funds are an ideal way to invest in certain securities, without the intense market analysis and understanding of economics required when going it alone. However, you’ll also lose control over this portion of your portfolio. Individual Retirement Account (IRA) – We already discussed annuities earlier, but another popular retirement tool is an IRA. Here, you’ll be able to add assets like stocks, bonds, and mutual funds and keep them tax-deferred until the appropriate time. There are several different types of IRAs, each of which comes with its own set of restrictions, usually based on income and/or employment. Common examples include traditional, Roth, and SEP.
529 Plans – Another type of tax-advantaged savings plan, a 529 plan allows you to set up a pre-paid tuition plan or savings plan to help pay for future college costs. While 529 plans can be great for disciplined savings and for taking advantage of tax breaks, there can be some steep penalties if the money isn’t used for education. Also, they may come with higher fees than other options (more soon). Exchange-Traded Funds (ETFs) – Similar to a mutual fund, an ETF is a portfolio of securities that is overseen by a manager. Unlike mutual funds, though, ETFs are traded as a single stock, allowing investors to sell and hold as they see fit. There are hundreds of ETFs currently traded on major exchanges, which offer liquidity, low volatility, and diversity, but can also deliver insufficient diversification and come with steep fees. If you pass away unexpectedly, a life insurance policy can help ensure your loved ones are financially cared for in your absence. MassMutual offers several popular types of life insurance polices, which can be complemented with other long-term care planning options (depending on your state of residence). Whole Life Insurance – Also known as permanent life insurance, whole life insurance policies are guaranteed to pay out at some point. The underlying insurer will invest your premium payments throughout the policy’s term, which may accumulate a cash reserve. Once this reserve gets high enough, you may be able to save, reinvest, or pay future premiums with these earnings. Whole life insurance is typically more expensive than term life (more in a second), you won’t be able to choose the underlying investments made by the insurer, and their conservative strategy often translates into meager returns. Guaranteed Acceptance – As you might imagine, coverage under guaranteed acceptance life insurance policies is assured for the life of the policy, without any premium increases. On the flip side, because coverage can't be canceled, guaranteed acceptance policies tend to come with higher premiums than other options, as well as fairly low death benefits. Term Life – Term life insurance policies are only valid for a certain period (generally 20-30 years), and they don't accumulate cash value like a whole policy. As a result, their main purpose is to provide your family with financial support should you pass away prematurely. While term life policies are often inexpensive when you’re young, they’ll gradually become more expensive as you get older, and your premiums can increase during the policy term. Universal Life – Like whole life insurance, universal life insurance is a permanent policy (intended to last throughout your life). However, universal policies can offer varying cash accumulation rates, depending on the underlying investments. Universal life policies might be ideal if you’re looking to cash out some of the policy’s value while you’re still alive, or if you want to provide input on where your premiums are invested. Variable Universal Life – Variable universal life (VUL) policies also gain cash value, although you’ll have the ability to invest this money in your choice of accounts, including stocks and bonds. While VUL policies can put you in the driver’s seat as far as your underlying investments, they also tend to be more expensive than other types of permanent life insurance policies. MassMutual’s wealth management services promise to help you “accomplish a wide range of objectives” through estate consultation, trusts services, investment management services, and more. All MassMutual’s wealth management strategies are customized based on your needs, after working with you and other professional advisors. 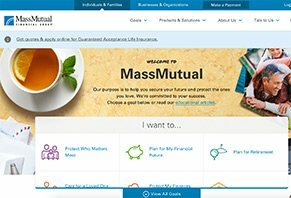 Here, MassMutual teams up with employers to provide workplace benefits that can help employees administer their retirement plans; provide workplace portable, level premium group whole life insurance, supplemental individual disability income insurance, executive-level life insurance, and more. How much will you pay for each of these services? What Are MassMutual’s Rates & Fees? As you might imagine, what you’ll pay as a MassMutual client depends on the specific services and tools you choose, the amount you’re investing, your financial goals, and many other key factors. For example, mutual funds may come with a sales charge on purchases, as well as a 1.5% annual fee to cover the costs of doing business. On the other hand, ETFs are typically commission-free and come with low management fees, regardless of the provider. Fees on 529 plans can vary, but on average, you’ll pay about 0.21 percentage points more per year in fees than a similar mutual fund. You’ll also need to factor in maintenance fees to cover administrative costs. Annuities can come with some steep fees as well, and they’re only as strong as the issuer’s financial capacity (more about this in a second). In order to learn more about the rates and fees you can expect, perhaps the easiest option is to enter your zip code on the MassMutual website to locate a financial professional near you. What Are MassMutual Clients Saying In Their Reviews? Based out of Springfield, MA, MassMutual has been in business for more than 160 years and is one of the largest life insurance companies in the U.S. They held an A+ rating with the Better Business Bureau, with no customer complaints (as of 11/28/16). Financial ratings? MassMutual had an A++ (Superior) with A.M. Best and an Aa2 (stable outlook) with Moody’s. Despite their size, time in business, and strong financial ratings, though, there wasn’t a whole lot of direct customer feedback for MassMutual at the time of our research. 19 customers provided feedback on Consumer Affairs, giving the company an average rating of 3.8 stars. There, common compliments referenced solid customer service, the number of funding options available, and ease of doing business. On the other hand, what few complaints there were related to less-than-stellar service, along with fees and penalties. MassMutual had a similar 3.7-star rating on CreditKarma, with many of the same compliments and concerns. Are There Other Financial Services Companies Like MassMutual? Whether you’re looking for a robust suite of financial services or just insurance; hands-on planning from a professional or a set-it-and-forget-it investment strategy, there are hundreds—perhaps thousands—of well-known companies vying for your business. How can you possibly make sense of all these options and figure out which are right for you? Perhaps the best method is to reach out to a financial advisor or planner, who can then help you decide your best course of action. Pro tip: Be sure to also read How to Find a Financial Advisor You Can Trust! You can even get help finding one of these financial professionals through companies like GuideVine! Bottom Line: Is MassMutual the Right Financial Services Company For You? As a mutual company (also commonly referred to as a cooperative), MassMutual is a private entity owned by clients and policyholders. One of the distinguishing features of a mutual company is that they pay out profit to owners in the form of dividends each year. On the up side, this means that mutual companies aren’t beholden to shareholders, but it also means that raising capital—and maintaining financial strength—can be more challenging. Comparing mutual companies like MassMutual with stock-based financial services companies, which option is right for you? Again, this is a highly personal decision, based on your current financial situation, your goals, and many other factors, and is something you’ll only be able to determine by speaking with a professional. If you’re looking for a next step in the process, we might recommend reaching out to a financial advisor or planner. Or, if you have remaining questions about MassMutual’s products and services, be sure to give the support department a call first. After all, they seem to get high marks from customers! Before you go: As a MassMutual client, what do you think of the company? Tell us all about it by writing a review below! It took over a year for MassMutual to send a check after my daddy died. When my mom died, they said the claim would be processed and mailed within 10 days. Twenty-two days later, we still don't have a check. Write a Review for MassMutual!